Broadcast equipment is built to last, but it’s also notoriously expensive. Without this stockpile, the Foundation would have needed to raise many thousands of dollars in additional funds to complete this project… a prospect that would have been daunting at best, and impossible at worst. In addition to the hardware stash, Kanabec Systems has also taken on the task of building a playout/automation system for the station – a full-featured setup identical to those the company supplies to its paying customers – as well as a on-air telephone system. Both will be given freely to the Foundation once complete. On the transmission side of things, Kanabec Systems spent months tracking down and acquiring an appropriate transmitter setup for the station, along with the required broadcast antenna and other needed parts. 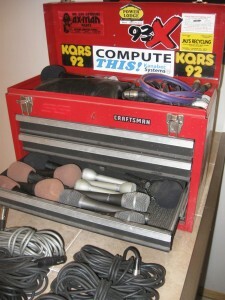 These items are being provided to the Foundation at cost, paid for by a no-interest loan whose payments will be deferred until the station reaches financial stability. And, of course, there’s also space, time, and expertise. Kanabec Systems owner Keith Thelen has committed to provide his labor free of charge to get the station up and running. Likewise, the station’s studios will initially be housed in “borrowed” space at the company’s facility south of Mora. Both the Foundation and Kanabec Systems look forward to the completion of what will surely be a top-notch broadcast facility, and to serving the Mora area with a local, live, non-commercial radio station that will be second to none.